Aramark Higher Education - Creative Communications and Graphics, Inc. Your Identity is Key to Establishing a Relationship with Your Client: Not everyone requires a rebranding. Plenty of our clients have spent countless dollars on developing just that! We respect that. We are careful to represent your organization as it is known to the public. CCandG is building the new Aramark Higher Education website to be a compliment and valuable marketing asset to their current marketing. We have been able to elevate their exposure with particular attention to design, coding and SEO. 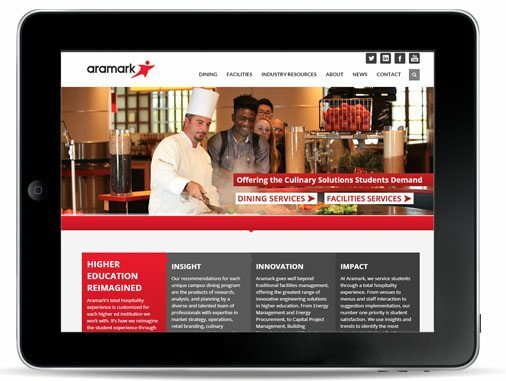 Aramark Higher Education needed an interim website while the in-house design team put together the new Higher Ed website. CCandG put together a high-end flexible website while the existing site was being built. This site offered a mobile-friendly site that met Armark’s branding guidelines. 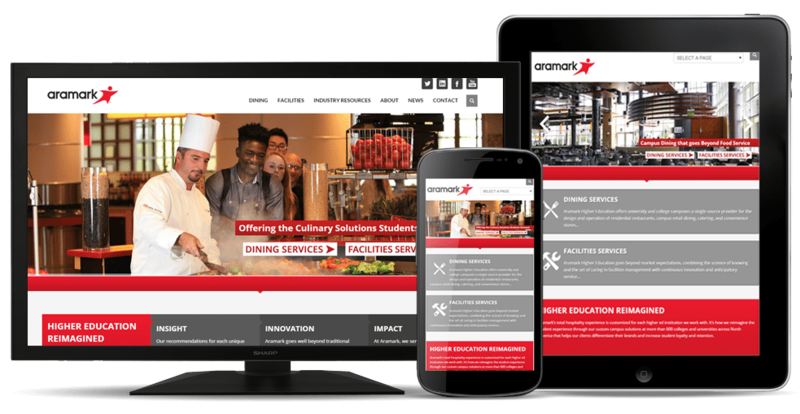 We utilized the power of WordPress to create a site that could easily be updated by Aramark, while still maintaining their corporate appeal.